This is great news! Mr. Hugh Akins has reactivated the League of Christ the King (LKC) under the auspices of the SSPX-Marian Corps. Deo gratias! I have created a pdf version of this letter, which may be downloaded here. I have created a pdf version of this document, which may be downloaded here. Mr. Akins will also begin again publishing the official quarterly magazine of the League of Christ the King called ‘Oportet Christum Regnare’ (Christ Must Reign). This magazine is subscription based, but you may also purchase individual issues. More information on this may be downloaded here. You are most welcome to print out copies of any of the downloads and distribute them to Catholic men who may be interested. The call to action is now! The Holy Cross Monastery in Brazil is willing to offer Masses for the Poor Souls in Purgatory without stipends. Please see here for more information. The transcript of this open letter may be downloaded here. In other words, most of us can benefit from this sermon. “On the morning of Tuesday 23 September from 11 am to 1 pm, a cordial meeting took place at the premises of the Congregation for the Doctrine of the Faith, between Cardinal Gerhard Ludwig Muller, prefect of the Congregation for the Doctrine of the Faith and Bishop Bernard Fellay, superior general of the Society of St. Pius X. The meeting was also attended by Archbishops Luis Francisco Ladaria Ferrer, S.I., secretary of the same Congregation, Joseph Augustine Di Noia, O.P., adjunct secretary and Guido Pozzo, secretary of the Pontifical Commission Ecclesia Dei, along with two assistants from the Society of St. Pius X, Rev. Niklaus Pfluger and Rev. Alain-Marc Nély. And the betrayal of the Catholic Faith and mission and memory of Archbishop Marcel Lefebvre by the superiors of the neo-SSPX proceeds…..
A parishioner passed on this meditation from the back cover of “Read Me or Rue It… How to Avoid Purgatory” by Father Paul O’Sullivan O.P. The everlasting God has in His wisdom foreseen from eternity the cross that He now presents to you as a gift from His inmost Heart. This cross He now sends you He has considered with His all-knowing eyes, understood with His Divine mind, tested with His wise justice, warmed with loving arms and weighted with Hi own hands to see that it be not one inch too large for you and not one ounce too heavy for you. He has blessed it with His holy Name, anointed it with His grace, perfumed it with His consolation, taken one last glance at you and your courage, and then sent is to you from Heaven, a special greeting from God to you, an alms of the all-merciful love of God. Fr. 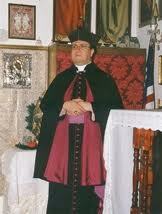 Gregory Hesse (+2006), Doctor of Sacred Theology and Canon Law, gave this conference in Louisiana when he visited Fr. Paul Trinchard in 1997. Fr. Hesse exposes here some of the errors of the Second Vatican Council. Father condemns the Council, as a whole, as being unacceptable to a Catholic. Compare this to Bishop Fellay’s position that he would hope the Council belongs to Catholic Tradition. This difference in position regarding the Council’s place in Catholic Tradition is a key factor in separating the SSPX of Archbishop Lefebvre, which continues in the Resistance, and the neo-SSPX of Bishop Fellay, which is not different in substance to the Ecclesia Dei communities. My friends, make no mistake about it; the Church will one day condemn the Second Vatican Council and the post-Conciliar reforms, especially the Novus Ordo Missae. When that day happens, you will hear me singing the “Te Deum”!